Online campaign planning gives full insight into premium pricing, even before signing contracts. 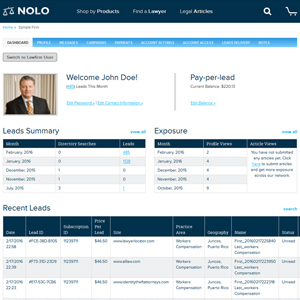 View expected lead volumes, actual leads, and pricing for your chosen practice area and geography. Test 'what-if' scenarios by adding/removing practice areas or geographic locations. Article publishing program to help you reach even more consumers by sharing knowledge through articles and resource guides. Subscribers have seen a 50% increase in profile views due to articles. 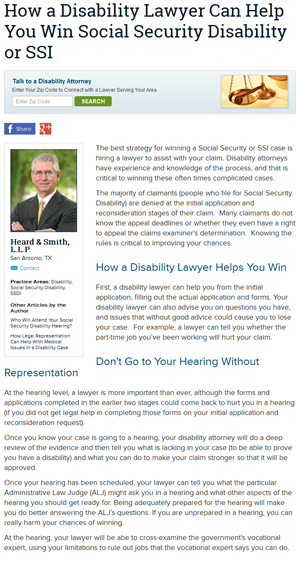 Within a month of publishing, many articles begin to appear prominently on popular search engine results. Gives subscribers instant tracking into subscription performance (lead volumes, profile & article views, and more). 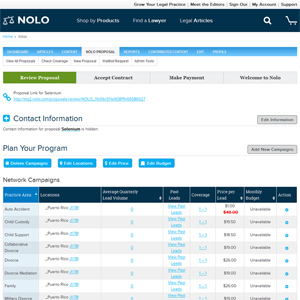 Stats are real-time and accessible 24/7 through Nolo login. Create a powerful online presence with your custom profile. 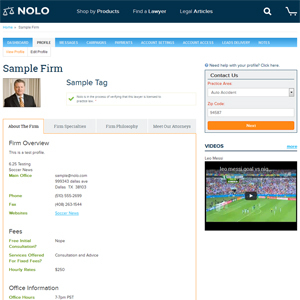 Option to add videos, taglines, resume, case history, photos, and more. You control your brand and can update your profile at any time.